Decorative Brass & Wrought Iron and Ornamental Iron Components, Fencing, Railing, Gate Grill Parts, Hardware & Accessories. 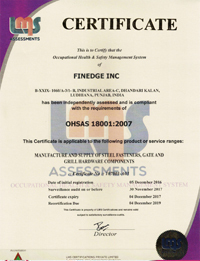 FINEDGE INC. Welcomes You ! Situated at Ludhiana, Punjab, FINEDGE INC. has evolved as a competent & reliable manufacturer of Wrought Iron Decorative Products, Fencing and Railing Hardware & Gate Grill Parts. FINEDGE INC. have been able to acquire a desired position in the market. In-depth domain expertise and business strategies have aided us in expanding our operations all across the nation. FINEDGE INC. is leading the way in producing and exporting wrought iron, ornamental iron, cast iron, gate grills and stair parts and accessories. For over years we have offered an extensive line of wrought iron and ornamental iron products. 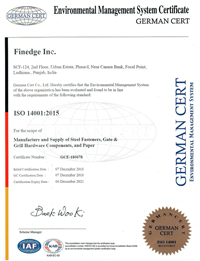 FINEDGE INC. keep an eagle eye during the entire manufacturing process of our products, to ensure the best quality wrought iron products in the industry. We have a highly skilled team of quality controllers and they conduct strict quality test on varied parameters. 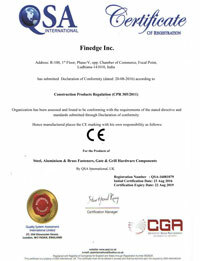 To keep the environmental guidelines in view we are registered as an ISO 9001:2008 Certified firm. Whether you are looking for traditional, modern or Custom Ornamental Ironworks. Our fencing and railing accessories are look great for your outdoor needs. Our internationally designed state of the art infrastructure available with us helps us in delivering a better wrought iron range of products to our clients. Divided into several units for maintaining flow of production process, we are able to manufacture products ensuring zero defects. In our wrought iron production unit, we have installation of latest machines. Our in-house manufacturing of wrought iron gate parts allows us to offer some of the most competitive prices of our products for exports from India. 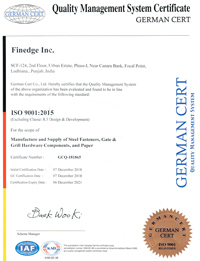 Finedge Inc. are exporting wrought iron hardware, gate-grills parts, railing & fencing products to our clients in international market like USA, UK, Australia, Canada, Holland and Gulf Countries (Iran, Saudi Arabia, Qatar, Oman, Bahrain, Jordan, Israel, Yemen, Egypt, Greece, U.A.E. & Kuwait), Malaysia, Indonesia, Singapore, Thailand, Turkey, Mexico, Brazil, Chile etc. FINEDGE INC. have many different styles & designs of ornamental iron items available to our customers. Whether you are looking for traditional, modern or Custom Ornamental Ironworks we have solutions for all. Our fencing and railing accessories look great for your outdoor needs and even for exterior gates. Our team consists of well experienced and skilled staffs, who are continuously engaged in delivering a better range of ornamental iron product and building strong relations with clients. People working with us have helped us in expanding our business from national to global market place. FINEDGE INC. is the fastest growing fence parts manufacturer and distributor of decorative and ornamental iron fencing parts, aluminum fencing hardware and gate grill accessories. Our world class products meet the highest standards of excellence for fence design, durability and functionality. Our decorative iron fencing is the highest in quality, easy to install, will never rust and is backed by the best manufacture technique in the fence industry. We are serving various industries of the world like Gate Grill Manufacturers, Fencing Manufacturers, Ornamental Iron Products Manufacturers, Railing System manufacturers, Decorative Iron Doors, Stairs and Grills manufacturers, Wrought Iron Garden Furniture Manufacturers, Wrought Iron Craft manufacturers, Wrought Iron Gates and Grill parts & Accessories Importers, Traders, Distributors and Sellers etc.